Mia Channing appears to have an enviable life: a beautiful home in the village of Little Pelham, a happy, stable marriage, a job she enjoys and three grown up children to whom she's devoted. But appearances are deceiving; the truth is that it's all a precarious balancing act. When the family gather for her son's thirtieth birthday, Daisy, her youngest daughter, drops a bombshell in the way only Daisy can. Once again Mia finds herself cast in the role of peacemaker. It's a role she's tired of, particularly since her husband refuses to believe he's responsible for the problems they're facing. Not surprisingly, Mia longs for escape. For Owen Fletcher, buying the Hidden Cottage was the fulfillment of a lifelong dream and provides the perfect escape for him. When Mia meets him, she must decide whether she has the courage to do something for herself for a change. And if she does, can she ever go back to the life of compromise she had before? With an insatiable appetite for other people's business, Erica James will readily strike up conversation with strangers in the hope of unearthing a useful gem for her writing. She finds it the best way to write authentic characters for her novels, although her two grown-up sons claim they will never recover from a childhood spent in a perpetual state of embarrassment at their mother's compulsion. 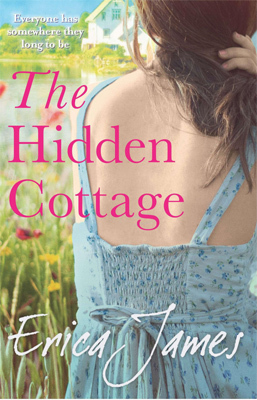 The author of many bestselling novels, including Gardens of Delight which won the Romantic Novel of the Year Award, and her recent Sunday Times top ten bestseller, The Queen of New Beginnings, Erica now divides her time between Cheshire and Lake Como in Italy, where she strikes up conversation with unsuspecting Italians.